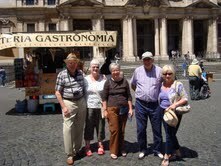 Six members of Sherborne Castles Rotary Club together with their spouses enjoyed a pleasant and successful trip to Rome in May. The main objective was to meet up with members of the Foro Italico Rotary Club in Rome and to share experiences with them, adding to our knowledge of how other clubs in other countries arrange their activities and fund-raising. The host club treated the Sherborne visitors magnificently, chauffeuring us to and from the club meeting where we met about 40 of their members over dinner. Lady guests were presented with an alabaster pot with a hand-painted lid, individually prepared by Architect Patrizia Aloisi, one of the Rome members. Sherborne Castles members spent four nights in Rome and enjoyed various splendid meals as well as visits to some of the major attractions.